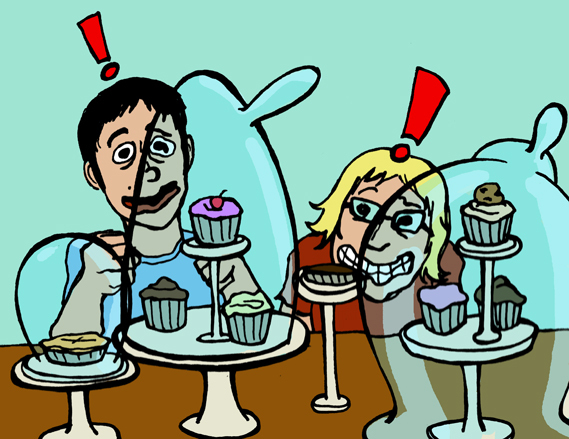 Buzz Bakery has always been on our to-review list, since they’re the ones behind the delicious 9:30 Club cupcake (a cupcake while watching the Dismemberment Plan? score!). They recently opened up a new location right across from the Ballston mall, which is way more metro-accessible than the original Slater’s Lane location. Alexandria– about a mile from the Braddock Road station on the Blue line. Arlington– a few blocks from either the Ballston or Braddock Road stations on the Orange line. 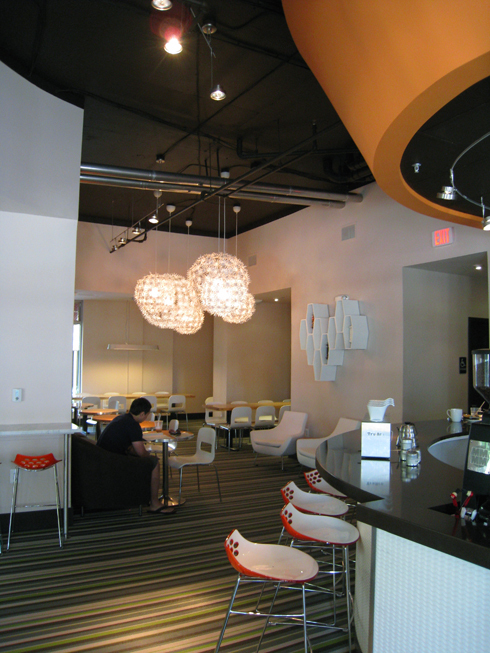 Seating: Quite a few tables, chairs, benches, couches…pretty nice set-up in either location! Sweets: Since it’s a bakery, it runs the gamut–brownies, pies, cookies, cupcakes, homemade pop-tarts…there’s also homemade granola bars, homemade ice cream, and savory things like paninis and waffles (well, waffles are still pretty sweet). …and a Chocolate Chip Cookie Dough cupcake. 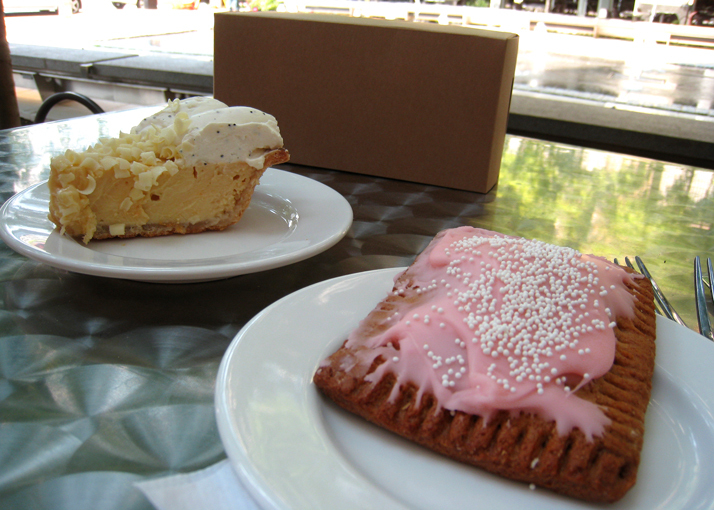 We’ll stick to reviewing just the cupcakes (though the pie and pop-tart were definitely worth trying). 9:30 Club Cupcake–This cupcake is the reason why I make sure I get to concerts early, since the club always inevitably runs out within thirty minutes of opening the doors. It’s basically an adult Hostess cupcake, complete with squiggle frosting (not evident from our photo–alas, these two cupcakes spent thirty minutes outside in 90-degree heat). Chocolate cake, chocolate ganache on top, and cream inside–an most excellent combination! 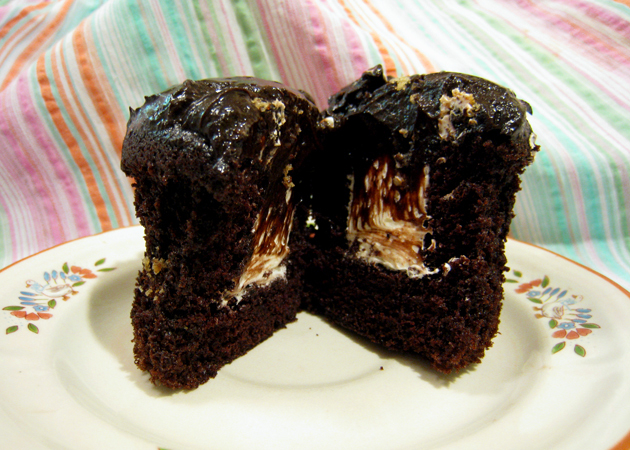 The chocolate cake is moist, the ganache adds a nice bit of richness, and the cream filling takes you back to the days where you shoved any number of Hostess cupcakes/Twinkies/Ding Dongs/etc. down your maw. Drawback? It’s a bit expensive for the size, especially compared to Baked & Wired’s whoppers ($3.50). Chocolate Chip Cookie Dough–I have mixed feelings on this one. The filling is delicious (actual raw cookie dough, yessss! 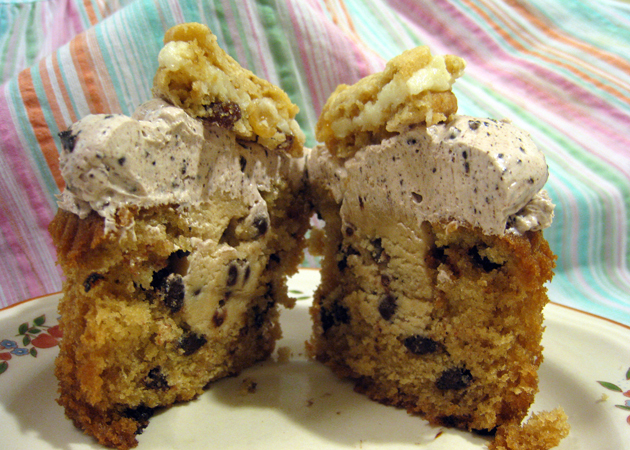 ), and the mini oatmeal-cream sandwich cookie on top even more so, but the cake and frosting? Eh. The cake mimicks a chocolate chip cookie with the chips speckled throughout, but it was somewhat dry and bland; the frosting is an empty promise, as it looks like cookies n’ cream yet tastes like nothing. 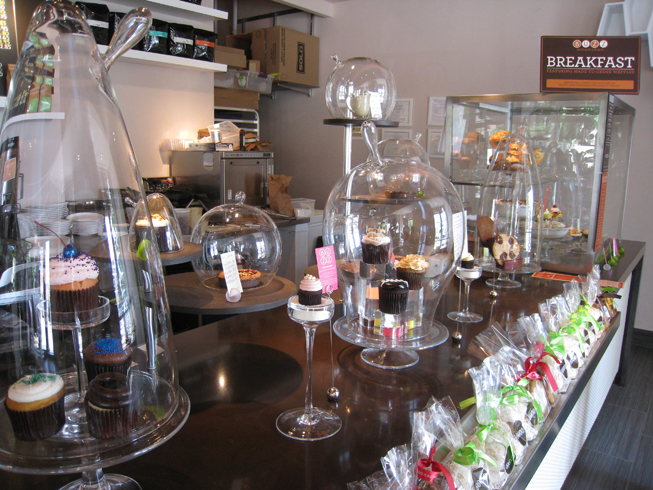 A disappointment, especially for the most expensive cupcake at $4.00(!!!). 9:30 Club Cupcake–I have had dreams about this cupcake. I think it’s a great flavor. Chocolate, chocolate, and cream! Much as I love it, I get taste overload from chocolate-chocolate-chocolate flavors (such as Baked & Wired’s Chocolate Doom). I like flavor variety within my desserts, so this a a good mixup of the usual chocolate cupcake. Chocolate Chip Cookie Dough–Hm. Nice, but the cookie dough cupcake at Frostings (in Richmond, VA) was so perfect that this Buzz version seems to fall short. Nothing remarkable. As Kendra says, not a good deal, value for dollar. I wouldn’t order it again.